The main idea is that all stock indices are quoted in particular currencies and therefore demonstrate correlation with Forex pairs where these currencies are used. When market makers decide to "buy" one or another stock index, they sell currency the index is quoted in. For example the S&P500 upward trend is usually confirmed by the USD downward trend. And likewise, USD usually grows when S&P500 and other American indices fall (people may be said to go into cash). 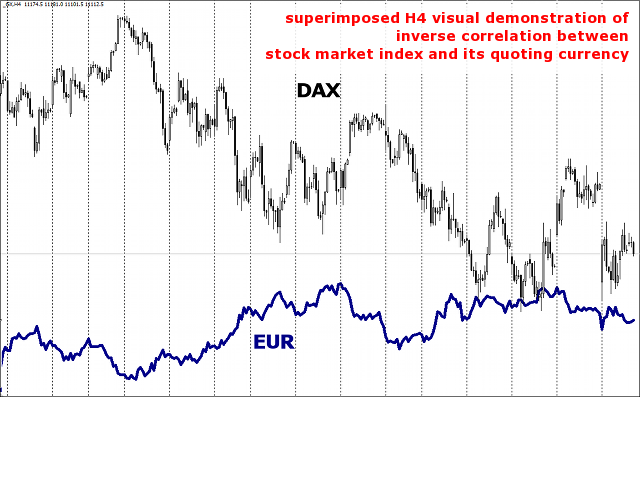 This is illustrated in the first chart below with DAX and EUR superposition (note that this is EUR, not EURUSD or any other pair which contains EUR). The indicator calculates synthetic rate between two stock indices and compares it with a real symbol rate. For example, in case of EURUSD one can choose DAX vs S&P500, or CAC40 vs Dow Jones for analysis. S&P500 represents S&P500/USD in Forex terms, an DAX is the DAX/EUR pair. Thus, ratio of these two indices forms an alternative rate of EUR/USD. The indicator shows this synthetic as such (the ScalingPeriod parameter is set to 0, see below) or as values normalized respectively to the specified moving average (ScalingPeriod exceeds 0). But the most important thing is that these normalized values of a standard Forex symbol and its synthetic analysis are displayed side by side demonstrating convergence and divergence phases. The indicator works well with such strategies as pairs trading and hedging: trade the Forex pair in the direction of the synthetic, and optionally trade indices in the opposite direction. If only Forex pair is traded, your broker does not have to have indices in the allowed trading mode. Indicatives will be enough. 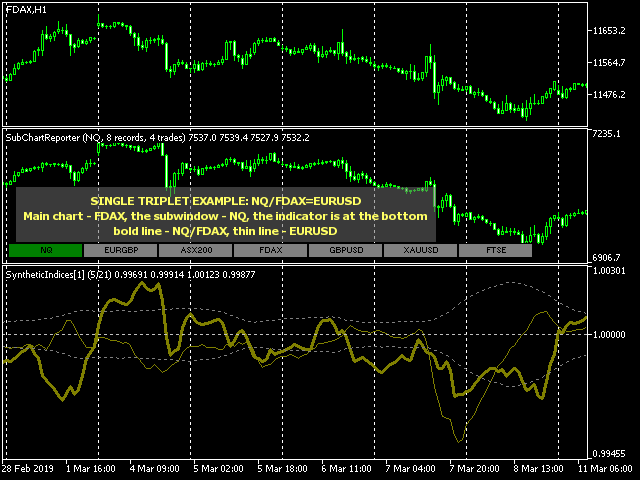 If indices are not specified, the indicator outputs hints for major Forex currencies into the log. Tickers for market indices specified in inputs must be available in Market Watch. The indicator works solely with standard quotes from your broker and does not request any external services. Preferred timeframes: H1 or higher.